Join us for the 9th edition of Devour! The Food Film Fest from October 22-27, 2019 in Wolfville, Kentville and Kings County, Nova Scotia. Check out our Devour! promo reel here. Devour! The Food Film Fest is a transformative food and film experience combining cinematic excellence with extraordinary gastronomic activities. The annual six-day festival hosts 100+ events, celebrated filmmakers and high-profile chefs from around the globe. In 2018, Devour! 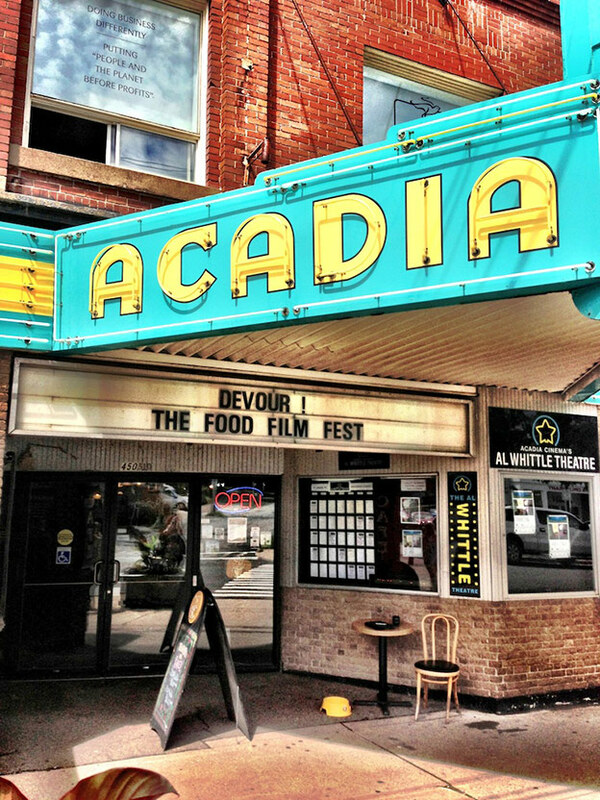 attracted almost 13,000 food and film lovers to Wolfville, Nova Scotia, Canada. The festival has become a destination for celebrities and notable chefs including Jason Priestley, Anthony Bourdain, Jacques Pépin, Dominique Crenn, Chuck Hughes, Michael Städtlander, Normand Laprise, Michael Smith, John Higgins, Gordon Pinsent and Bill Pullman. Each year, a major icon kicks off the festivities and top chefs from across Canada and around the world collaborate on a special Gala Dinner. This year, Sam Kass, former White House chef to the Obamas and healthy food advocate, opened the festival with his favourite food film of all time, Jiro Dreams of Sushi. Devour! challenges people to think differently and create a deeper connection to food through some of the most engaging documentaries, dramas and short films. The festival’s finely curated program highlights current food trends and issues, farming, sustainability and the impact of current food systems on our lives. Festival-goers delve deep into the world of food through original one-of-a-kind experiences, from interactive industry sessions with high-profile guests, to cooking demos, foraging adventures, plus film and photography workshops. Devour! The Bounty of Kings County Tasting Tours include food and wine-focused excursions showcasing some of the region’s exceptional artisanal products and award-winning wines. Other popular events include experiential dinners, food truck rallies, celebrity visits, host receptions and charitable community events. Just one hour from Halifax and Stanfield International Airport, Devour! takes place in Wolfville, in Nova Scotia’s Kings County. Known as the agricultural heartland of the province, the area is home to a thriving wine industry and warm, hospitable community with a longstanding farm-to-table ethos. A rich cultural landscape infuses the region and its people with a respect for the surrounding riches. No place could be more fitting to explore our relationship with food. Devour! The Food Film Fest is managed by festival organizers Michael Howell and Lia Rinaldo. The non-for-profit is overseen by an executive board and advisory council made up of key partners from the film, business and culinary sectors. Public sector partners such as Atlantic Canada Opportunities Agency, Taste of Nova Scotia and Select Nova Scotia have joined the festival’s founding partner, Slow Food Nova Scotia, in support of the event. Over the past four years, the number of festival partners has almost tripled, including CBC as television and radio partner. Devour! has grown steadily since its inception. Box office numbers continue to climb on a yearly basis (from just over 3,000 attendees in 2013 to 13,000 in 2018). Devour! has also garnered worldwide media attention with articles in The Hollywood Reporter, Screen International, USA Today, Saveur Magazine, The Daily Meal and Reader’s Digest. The 2018 festival is projecting nearly 13,000 attendees. Devour! has been recognized as a national culinary, hospitality and tourism trailblazer and named a 2017 Canadian Treasure by the Centre for Hospitality and Culinary Arts (CHCA) at George Brown College. Previous awards include the prestigious Gary MacDonald Culinary Ambassador of the Year Award (2014) at the Taste of Nova Scotia Prestige Awards.